Returning from our West Coast summer road trip, we decided to get some kicks on Historic Route 66 while driving back to Phoenix. We wanted to sample segments that veered away from Interstate-40 and into a different world. Heading on I-40 east in California, Route 66 veers well away from the interstate at the ghost town of Ludlow for about 75 miles before returning east of the town of Essex. This route through the heart of the Mojave Desert is highly recommended for those who like long, lonely stretches of road broken up by the occasional ghost town! 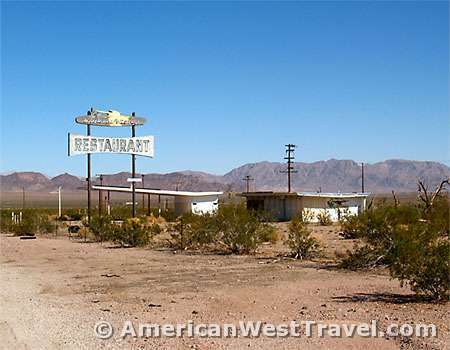 This page covers Historic Route 66 from Amboy to Essex, California. 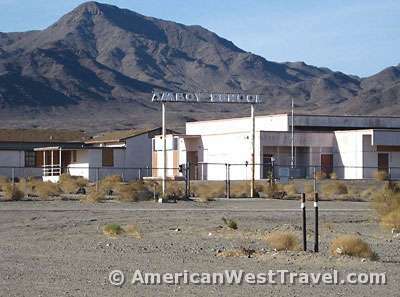 The town of Amboy was once a major Route 66 stop. 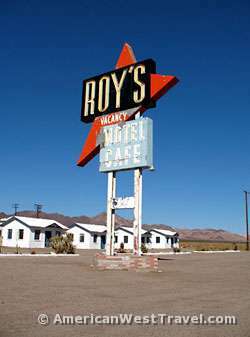 It’s major attraction was the famous Roy’s Motel and Cafe, opened in 1938, the only place around where you could get gas, food, and lodging at one place. Its even more famous sign was added in 1959. After I-40 opened in 1973, the town slowly became a ghost though it was occasionally used for photo shoots and once for a movie, and there is a chloride mining operation nearby. In 2005, a new owner purchased the entire town of Amboy with a commitment to preserve the town and reopen Roy’s. As of 2010, the gas station was open (with very expensive gas). Apparently there are also future plans to open a cafe and mini-mart. The only other open business was the town post office. Continuing east of Amboy we came upon the ruins of the Road Runner’s Retreat and soon the town of Chambless where all that remained was a water company building and the one-time Chambless General Store behind a chain link fence. The next town, Danby, featured a handful of dilapidated fenced-off buildings. There appeared to be squatters living in a couple of these ruins. Chambless, originally known as Chambless Station, is one of the "alphabet towns" located along U.S. Route 66 that provided water towers to service the Atchison, Topeka and Santa Fe Railway. It became a popular motorist and tourist stop for Route 66 travelers but has essentially disappeared since the opening of I-40 in 1973. The final town on this segment, Essex, California, was clearly a bit larger than the others. 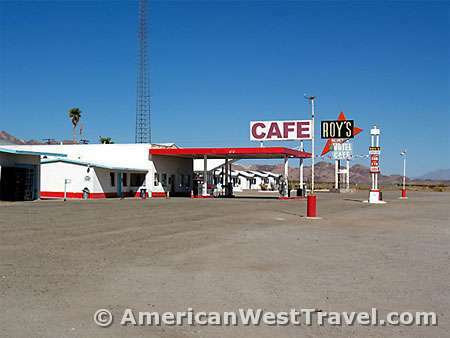 It had been a bustling oasis during the glory days of Route 66, featuring a garage, school, cafe, a post office, and a well with free water available to all travelers. 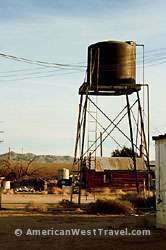 The well was installed by the AAA, as most businesses charged for water in those days. Essex, a former oasis along historic Route 66 in California, was allegedly founded when a motorist suffered a flat tire only to discover there were no garages for miles. However Essex, too, is on the way to becoming a ghost. The 2005 population was 89 people, with four children attending the school. On our 2010 visit, all that could be observed were the CalTrans maintenance yard, the decrepit remains of the garage, and many fenced-off, dilapidated buildings. East of Essex, Route 66 crosses I-40 and veers off to the north for a stretch. Due to the lateness of the day, we got back on the interstate and proceeded to Needles looking for a night’s lodging. The following year: We continued on Route 66 north of I-40. At the place marked Fenner on the map, there is nothing to see at all. The final stop before Needles was the ghost town of Goffs, California which is known for its restored 1914 schoolhouse. Along Route 66 there were a few ruined buildings. However a turn north on Lanfair Road brings you to the surprising Goffs Cultural Center which features the 1914 schoolhouse, a modern library, an outdoor museum loaded with relics, and a nature trail. The exact alignment of Route 66 has varied greatly over the years. For those wishing to trace the exact routes and alignments, The Mother Road, Historic66.com website is an excellent resource.